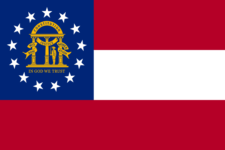 Georgia has a corporate income tax on corporations. (*Note: if the S-corporation status is recognized for Georgia purposes the shareholders of the corporation pay the tax as opposed to the corporation paying the tax): Corporate income tax is a non-graduated percentage based on a corporation's federal taxable net income Corporations that own property, do business in Georgia, or receive income from Georgia sources are subject to corporate income tax. Never forget to file GA 600 again.